I enjoyed this volume as much as Volume 2. I love seeing the different variety in art styles, and the range was wide here as almost every story had a totally different look and feel to it. Im not as much for the rhyming stories, but I know lovers of poetry would probably appreciate them more. Some of the stories are even silent, but the pictures tell the story without words. Overall, if you liked the first volume you'll like the second. 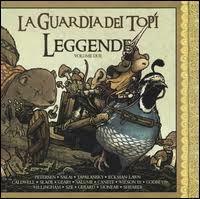 This is the second volume of Mouse Guard: Legends of the Guard that I have read and enjoyed. It's a collection or anthology of different authors and illustrators coming together to each tell their own fable or story in the Mouse Guard world (originally created by David Petersen). The collection of the first volume was excellent, with some truly stunning illustrations and whilst the stories are all fairly simplistic, they are all very beautiful in their own unique ways. I had a couple of really st This is the second volume of Mouse Guard: Legends of the Guard that I have read and enjoyed. 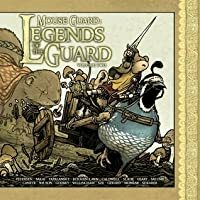 It's a collection or anthology of different authors and illustrators coming together to each tell their own fable or story in the Mouse Guard world (originally created by David Petersen). The collection of the first volume was excellent, with some truly stunning illustrations and whilst the stories are all fairly simplistic, they are all very beautiful in their own unique ways. David Peterson himself (he illustrates the joining story of the tavern where these stories take place between each one very beautifully). Alex Eckman-Lawn (whose style is subtle and soft with glowing colours and beautiful design). and finally, Jackson Sze (who used a much more loose and scene-based style for his story, but was utterly enchanting and the character expressions so cute). All of those I mentioned had excellent styles which were unique, quirky and very much to my taste. There were some styles which I didn't care for as much, as to be expected from an anthology, but it really worked as a whole. I gave this a 3.5*s which is a little lower than my rating for the previous, purely becuase there were a few more actual stories and illustrators that I really liked in the previous volume, but I would still say I am very happy to have read this one. Lots of mouse-y fun again, 3.5*s overall. The new season brings a new edition to June the Innkeeper's contest. Several mice with outstanding tabs at the inn are invited to tell a story in hopes of impressing June enough to forgo their tab. The contest is popular enough that some contestants don't even care about winning, only to be entertained and to please others with their tales of heroes, unlikely alliances, love, war, superstition, coming of age, exploration and even song. This was only all right. It's an anthology of a bunch of short stories, but most of them are SO short that I don't have time to care. I did like the art on the one that Willingham did. And I liked best the one that won the story-telling contest, the dialogue-less one about the mermouse. And I do like the interstitial art, by the actual Mouse Guard guy. I want more Mouse Guard! Actual Mouse Guards, guarding things! Stop anthologizing and get with the guarding. Bring on Spring! Sheesh. Well, I'm not sure what I thought I would get from this volume, considering how lukewarm I was about the first Legends book. This repeated the exact same scenario, this time with stories that felt even less fleshed out. Still love Mouse Guard...just going to stick to the main works in the series now. Prvá časť legiend bola viac-menej tajomná, okázalo expresívna a vážna. Len sem-tam sa stalo, že vybraní umelci vniesli do svojho rozprávania nejaký ten úsmevný šelest, komický prvok alebo jemnú satiru. Knihe to ale neublížilo, práve naopak, svojím tajomným nádychom zaujala čitateľov natoľko, až sa do nej úplne ponorili. Stalo sa, že medzi tými skvostami sa našli stránky, ktoré tak celkom nezapadli do celku, ale podobne, ako to je aj v tomto druhom prípade, i tam stále platí, že každý z nás má rá Prvá časť legiend bola viac-menej tajomná, okázalo expresívna a vážna. Len sem-tam sa stalo, že vybraní umelci vniesli do svojho rozprávania nejaký ten úsmevný šelest, komický prvok alebo jemnú satiru. Knihe to ale neublížilo, práve naopak, svojím tajomným nádychom zaujala čitateľov natoľko, až sa do nej úplne ponorili. Stalo sa, že medzi tými skvostami sa našli stránky, ktoré tak celkom nezapadli do celku, ale podobne, ako to je aj v tomto druhom prípade, i tam stále platí, že každý z nás má rád niečo iné. Druhá časť legiend je odľahčená. Oveľa intenzívnejšie sa pohráva s rôznymi odtienkami komiky, koncami s morálnymi alebo iba trefnými ponaučeniami, harmonickou dynamikou a ilustráciami, ktoré sú tento raz dominantné a odsúvajú text do úzadia, či ho vôbec neobsahujú. Nakoniec, výber autorov, po ktorom Petersen siahol, hovorí o tom, že legendy s poradovým číslom dva sa budú niesť v duchu „obrázkového umenia“ a čitateľovej predstavivosti. Čítanie medzi riadkami, aj tými kreslenými, nie je ale touto skutočnosťou sťažené, práve naopak, motivuje k tomu, aby ste v jednotlivých avantúrach stále hľadali všetko to, čo vám po prvý raz uniklo. Táto zábavná činnosť je natoľko očarujúca, až vám príde ľúto, že tých 144 strán ubehlo tak rýchlo. Thoroughly enjoyed this. Wonderful artwork and interesting story-telling combined. And how amazing to see the style of each artist in turn. A treat in every way - I usually enjoy stories in which small animals take on heroic roles, and this is another example of that. I recommend! Lovely -- I liked this even better than the first Legends of the Guard collection. Now I just want to know when Petersen will come out with another REAL Mouse Guard story! 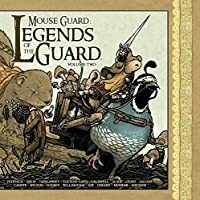 Volume 2 in the Legends of the Guard series holds up in comparison to Mouse Guard: Legends of the Guard, Vol. 1. I loved Bill Willingham's "The Veteran", but Bill fell just a touch short of my (and Petersen's) favorite - Christian Slade's "Love of the Sea". The love story between a sailor and mermouse proved to be immensely popular with Amanda and the kids as well. The anthology-with-guest-authors format has made reading the "Legends" series fun for our family. We'll give Volume 3 a look as well. Even better than the last collection! There were quite a few standouts in this one and pretty much every one was fun to read. A shout out in particular to the seaside love story, the legend of the four brothers, and the story of the young Guard and the cartographer (this one is gorgeous), but truly it was a solid collection overall. This is the second year in a row that the mouse innkeeper holds a contest to see which of her regular customers can clear their annual tab by telling her the best story. The stories are written and illustrated by people other than Petersen, so the styles vary widely, but I liked all of them this time around. Another wonderful anthology collection from the world of Mouse Guard. Again, this is the type of anthology that's actually wonderful (as opposed to being a money-making ploy). Good writing and pacing from quite a few authors, with Petersen's lovely interludes featuring June and a plethora of engaging mice. Sweet, but not as satisfying as the real deal. Only half of the stories are any good at all. It's pretty rich to produce one prequel (an another on the way), four anthologies (counting the FCBD collection), a RPG and to have a movie in the works when you're only two books into the MAIN STORY. Who are you really, David Petersen - George R.R. Martin? IT'S BEEN ALMOST TEN YEARS. GET ON WITH IT. Como siempre un excelente trabajo de ilustración por parte de todos los participantes. Así como June, me fue difícil seleccionar a mi favorito. Lo recomiendo mucho tanto por los dibujos como por las historias. Ahora me encuentro esperando ahorrar lo suficiente para comprarme el volumen 3. I druhy dil Legend serviruje presne to, co zname z minula - zhruba tucet kratkych pribehu ze sveta Mouse Guard. Nektere vynikaji kresbou, jine pribehem a dohromady tvori paradni mix, ktery vam zase o neco vic priblizi tenhle propracovanej svet. I think I enjoyed this collection better than the first but legends are great in general! I love the little short stories between all the different artists. Improves on the original volume of other artists putting their touch on the world of Mouse Guard. Some really amazing art within. Can't ever get enough of this world. Something enchanting about animals being the catalysts of stories. it's an anthology; some stories are great, some are well illustrated, some are neither, but all are quick. The Legends spinoff is pleasant enough, but inessential compared to the core Mouse Guard series. I won this in a contest and i'm glad I did, because I would probably never bought this myself and that would be a shame, because it's amazing. Not quite as strong as the first collection. Mouse guard is just too cute! I seriously love seeing the different artist ake on the mouse guard art but I love the original way too much! 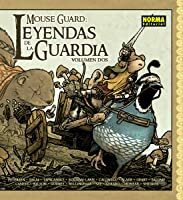 I have just started getting some advance copies of books and Mouse Guard: Legends of the Guard Volume 2 is one of the first books I have had the privilege to get to read and talk about for free before its release in a few weeks. Mouse Guard has been on my radar for a while, when I have seen samples of previous books or flicked through copies in book shops I have always been drawn to the beautiful images and when this combined with the positive word of mouth I heard about the series I really have I have just started getting some advance copies of books and Mouse Guard: Legends of the Guard Volume 2 is one of the first books I have had the privilege to get to read and talk about for free before its release in a few weeks. Mouse Guard has been on my radar for a while, when I have seen samples of previous books or flicked through copies in book shops I have always been drawn to the beautiful images and when this combined with the positive word of mouth I heard about the series I really have been long overdue in checking it out. This particular volume is an unusual starting point in that most of the book is written by a range of guest authors and illustrators rather than David Peterson. Starting in this way I cannot compare the book too much with the previous titles or comment on how the different writers draw from and expand the world of the mouse guard. What I can do is talk about the book as it exists in itself which is as a very fun and satisfying reading experience suitable for a wide range of ages from 6 up. The first anthology won the best anthology Eisner Award in 2011 and although I have not sampled that book I can say that this book is of truly an award winning standard. Each story is lovingly illustrated and this books makes an impressive showcase of both the wide range of talented comic illustrators we have working today and also how so much can be said so differently in a very small number of pages. I did not like all the stories equally and I initially made the mistake of trying to ingest all the stories at once rather than putting the book aside and returning to it but I did feel that every story added to the sum of the whole and was a charmingly presented tale well worth my time. I can see myself returning to the book as well as quite possibly picking up a copy for my 6 year old nephew in time for xmas. There is plenty of action in the stories which I think he will like and there is enough depth that he could keep coming back to it as he gets a little older. Some of the stories have a moral but it is never overly preachy and never gets in the way of the action. The stories are framed in the context of an inn in which all of the patrons with bar debts get a chance to have their debt wiped if they tell be best tale. This sort of conceit has been around at least as far back as Dickens and is somewhat overused but works fine as a framing device for the stories. Better than the first; still underwhelming. It's hard to mark up the demands for a creator-curated anthology such as this. And yet, with LEGENDS OF THE GUARD, VOL. 2, it is perhaps fairest to say that the breadth of stories constituting it's substance, though varied and occasionally dynamic, is its own curse. The previous volume's largest detriment was a lack of coherence. This particular volume appears to have resolved the dilemma of coherence but introduced the problem of continuity, or restles Better than the first; still underwhelming. The previous volume's largest detriment was a lack of coherence. This particular volume appears to have resolved the dilemma of coherence but introduced the problem of continuity, or restlessness -- a narrative impatience birthed by a desire to manufacture as many completely different stories as possible, in as little time as possible. Insofar as LEGENDS OF THE GUARD, VOL. 2 is a selectively entertaining book, one surmises that efforts to determine what creative or market forces insisted this be the case are anyone's guess. If this volume had half as many stories as the published thirteen, and were instead produced by (or limited to) those whose aesthetics were clearly a better marker for the subject matter than others, then this would be a much better product. On the plus side, the marriage of art style and story type is managed much better here than in the previous anthology. Jackson Sze and Nate Pride produce a sprawling adventure, tracking a young Guard Mouse and a cartographer, complete with softly shaded panoramas ("Back & Forth"); Stan Sakai authors a sweet but boring tale of an older mouse and her husband's near death at the hands of a fox ("Autumn Tale"); and Alex Eckman-Lawn and Nick Tapalansky contribute a sweeping tale of a hero's humility-in-the-making, with dark coloring and heavy pencils ("Leviathan"). The disparity between the best and the not-so-best is not as large as in Volume One. But no doubt, some entries feel needlessly esoteric or are otherwise inscrutable in the way they plod on and on. "The Timber Mice" is relayed by song sheet, and feels less of a creative experiment and more like a waste of energy; while "The Thief, the Star-gazer, the Hunter, and the Tailor" is merely a long and muddling bedtime story with too many characters and an incomprehensibly convenient denouement.